Then this is an advice and a reminder for all those who speak in the name of as-Salafiyyah, but when the Imtihaan (test) comes and when spears and arrows are directed at its liver by Ahlul-Makr (the people of vile deception), the Ahlul-Fitan (the people of trials and tribulations) and the troublemakers, we do not find them being from its army nor from those who fight for it but rather we find from them oddity and strangeness. Indeed there has appeared from those who claim as-Salafiyyah – who wait in ambush of it and its people – stances and actions which are in opposition to as-Salafiyyah, its Manhaj and its foundational principles which cause the hair upon the head to turn white (with grief). – Waging a wicked and oppressive war upon Ahlus-Sunnah, smearing them and marring their Manhaj and principles. (a) We correct but we do not disparage”. (b) Also: “The vast all-embracing Manhaj which accommodates Ahlus-Sunnah – according to their own technical term – and also accommodates the whole of the Ummah” but rather it encroaches and restricts the Ahlus-Sunnah and their Manhaj and their principles. (c) The Manhaj of al-Mawaazanaat. (d) The taking of Mujmalaat (the general spurious statements) of the people of misguidance upon their Mufassilaat (clear specific/detailed statements), whilst it is clear that these Mufassilaat (detailed statements) were held by them before these Mujmalaat (spurious/general statements). And other such principles which Ahlus-Sunnah have condemned and clarified their falsehood and deviation. (a)The [false] principle – (It’s not obligatory upon me). (b) Also the [false] principle – It does not satisfy, convince, and persuade me. (c) And waging war against the foundational principle of al-Jarh al-Mufassar (the detailed disparagement/criticism). (d) And the rejection of the report of trustworthy narrators (at-thiqaat). (e) And putting the condition of having a consensus [of the scholars] in tabdee (pronouncing a person to be an innovator) of any innovator. Even if/no matter if the proof and evidences have been established which necessitates/obligates their tabdee, and no matter what the status/level of the one who rules with that tabdee and even if they are many in number; if one person from the people of desires opposes them, then this tabdee is dropped (becomes null and void). (f) They have fabricated a principle to (revile and insult) the companions of Muhammad (sallallaahu alaihi wasallaam) with the vilest of revilements and insults by describing them as al-Guthaa-iyyah (scum). When requested to excuse themselves from that they said: (It is not revilement, it’s not revilement.) And they said: (if this wording emanated from a Sunni then it is not revilement and if it came from a Raafidee then it becomes revilement and insult.) And they have been staunch upon this since 1424H up until this day. And these principles have become the fountains of Fitan like pieces (sudden amassing of clouds) of the dark night. Accompanying all these calamities is arrogance, obstinate opposition and haughtiness towards those who advise them and clarifies their deviation and their mixed up confusion. Whilst with all these calamities, afflictions and other than that we still find those who commend them and declare that they indeed are from Ahlus-Sunnah. And the following are Prophetic Narrations I gathered together to remind those people so perhaps they will remember and withdraw/ be rebuked from that which they are upon. This Hadeeth is Saheeh (Sound Authentic). It is reported by Imaam Ahmad in his Musnad (1/5), Aboo Dawood in his Sunan Hadeeth (4338, Ibn Maajah in his Sunan, [Chapter] Regarding the Fitan, Hadeeth (4005) and is also reported by other Imaams. This Hadeeth is reported by at-Tirmidhee in al-Fitan, Hadeeth (2169) and he said: This Hadeeth is Hasan (Good). But there is weakness in its chain of narration. And it is also reported by Imaam Ahmad in his Musnad (5/388). And at-Tirmidhee declared the hadeeth Hasan due to it having two witnessing (supporting) narrations with a similar meaning which have a weakness in their Isnaad (chain of narration). One of them [witnessing narrations] is the Hadeeth of Aishah – radiallaahu anha – reported by Imaam Ahmad in his Musnad (6/159), the second of the two is the hadeeth of Aboo Hurairah – radiallaahu anhu – reported by al-Bazzaar in his Musnad (8508) and al-Khateeb in his at-Taareekh (13/92). And based upon the various routes (chains) the grading of this hadeeth is raised to the level of Hasan li-gayrihi. Al-Allaamah al-Albaanee has declared it to be Hasan in Saheeh al-Jaami (6947). There is not a Prophet that Allaah sent to a nation before me except that he had Hawariyyoon (helpers) and companions who would betake with his Sunnah and follow his command. Then after them came people who would say (speak with) that which they do not do, and they do that which they are not ordered with; so whoever fights them with his hand then he is a believer, and whoever fights them with his tongue then he is a believer and he who fights them with his heart then he is a believer, and there is not even a mustard seeds amount of faith (Eemaan) left after that. Reported by Muslim in [the Book of] al-Eemaan Hadeeth (50), Aboo Awaanah (1/35, 36) and Ibn Mandah in al-Eemaan (page 183, 184). In these Ahadeeth is the clarification from the Messenger of Allaah -sallallaahu alaihi wasallam – to the danger of al-Munkaraat (the evils) of innovations and sins. And its danger and evil punishment is not just confined to those who perpetrate it, but rather it includes whoever Yudaahin (flatters and compromises) with its people and is amicable with them, and also it encompasses and includes more so whoever defends them (innovations) and its people. The affair becomes even more severe if he wages war against whoever forbids it (innovations) from the people of the truth, those well established within the boundaries set by Allaah, those who war with the people of Misguidance and Fitan (turmoil and trials). The example of al-Mud-hin (the compromiser) Allaah’s Hudood (orders and limits) and (in comparison to) the one who violates them (Allaah’s limits and orders) is like example of people who drew lots for (seats on) a ship. Some of them were on its lower part and others were on its upper part. So those that were on its lower part would pass by those in the upper one with the water which troubled them (the people in the upper part). Then one of them (the people in the lower part) took an axe and started making a hole in the bottom of the vessel. The people of the upper part came and said: ‘What is wrong with you?’ He replied, “You have been troubled much by me and I have to get water.” Now if they prevent him from doing that they will save him and themselves, but if they leave him (to do what he wants), they will destroy him and themselves. Reported by al-Bukhaaree in his Saheeh, [the Book of] Shahaadaat (Witnesses), Hadeeth (2686), Imaam Ahmad in his Musnad (4/268,269), at-Tirmdihee in al-Fitan (2173), Ibn Hibbaan as in al-Ihsaan (297, 298). The wording of this Hadeeth with Imaam Ahmad and at-Tirmidhee is: The example of the one who abides by Allaah’s orders and limits in comparison to al-Mud-hin (the compromiser) of Allaah’s Hudood (orders and limits) is like the example of people who drew lots for (seats on) a ship at sea. So some of them attained the upper part of it and the others got the lower part. Then those on the lower part climb up/ascend to draw water to drink and they pour it upon the people on the upper part. The people on the upper part said: “We will not let you ascend and harm us.” So those on the lower part said: “Then indeed we will have to bore into the bottom of the ship in order to get water to drink.” If they prevent them and forbid them from doing that they will all be saved and if they leave them they will all drown. Al-Mud-hin (the Compromiser): He is the flatterer who sees and hears al-Munkaraat (the evil) from the innovations and other than it and does not forbid from it. Rather he flatters and compromises with those who fall into it, perpetrate it and defend it. So how about if he goes beyond that to defending them, beautifies their image (present them in favourable light) and bears witness for them that they are from Ahlus-Sunnah. So how will he be, if he transgresses beyond all that by forsaking those who forbid from it, making the people think that they (Ahlus-Sunnah) are not upon the truth and are opposers to the correct Manhaj. These stances encourage the perpetrators of these evils to remain upon their misguidance; it compels people with weak personalities to have good suspicion of them and to plunge them into their outstretched arms and to aiding and defending them. [These are] the affairs which have lead many people to turn away from the Manhaj of the Salaf as-Saalih in many different countries. It is incumbent upon this type [of people] to fear Allaah. They should look again at and revise their stances with seriousness and sincerity. They should comprehend the dangerous effect resulting from their stances; for which they will asked about in front of Allaah ý The Mighty & Majestic ý on the day when no soul will be able to benefit another whatsoever. Furthermore, it is incumbent upon them to look again to their Bitaanah (close friends and companions) with seriousness for indeed the matter is dangerous. Friends on that Day will be foes one to another except Al-Muttaqoon (pious). Upon you is the taqwa of Allaah the Mighty and Majestic, sobriety and tranquility until the (new) Ameer comes for indeed he will come now. Then he said: seek forgiveness for your Ameer for indeed he used to love pardoning (others). And he said: To proceed: then indeed I came to the Messenger of Allaah -Salla Allaahu alaihi wasallam -and I said to him: “I want to pledge allegiance to you upon Islaam. So he put a condition upon me that I should (sincerely) advise every Muslim. So I gave him the pledge of allegiance upon that and by the Lord of this Masjid indeed I am to all of you a (sincere) advisor.” Then he sought Allaah’s forgiveness and descended (from the pulpit). Reported by al-Bukhaaree in his Saheeh, [the Book of] Faith (al-Imaan), Chapter: the statement of the Prophet Salla Allaahu alaihi wasallam -: “The Deen is sincerity to Allaah, His Prophet, the leaders of the Muslims and their common people. Hadeeth (58). And Imaam Ahmad (4/357). And also reported by al-Bukhaaree in [the Book of] Faith (al-Imaan), Hadeeth (57), and Muslim in [the Book of] Faith (al-Imaan), Hadeeth (56) both of them reported it in summarized form. I remind them with that which is in these Aayaat and Ahadeeth from the obligation of establishing the sincere advice to Allaah, His Book, His Messenger, the rulers of the Muslims and their common people. And with that which they contain from the obligation of forbidding the evil and the severe threat for those who do not establish these obligations and do not forbid the evil. And I say to them as Jareer said: By the Lord of this Masjid indeed I am to all of you a sincere adviser.” But rather I say: By the Lord of the Heavens and the Earth indeed I am to them a (sincere) adviser. Reported by al-Bukhaaree in [the Book of] Heart-Softening narrations (ar-Riqaaq), Hadeeth (6492), Ahmad in his ‘Musnad’ (3/157) and Aboo Y’alaa in his ‘Musnad’ Hadeeth (4207) and (4314). 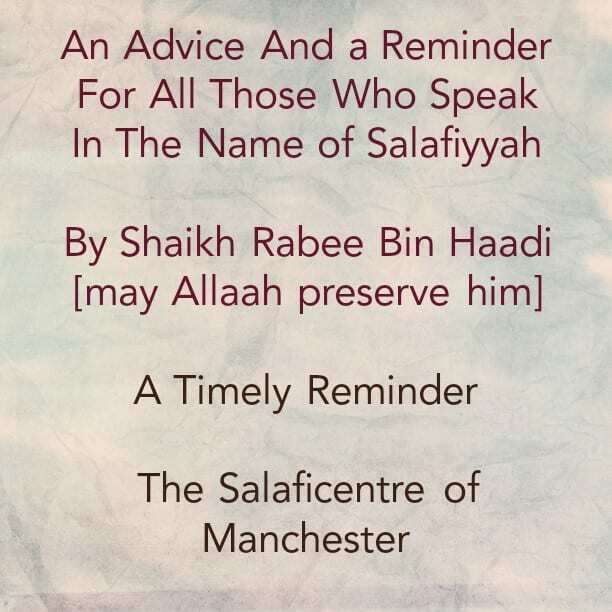 And from my advice to them is that they should study the Manhaj of the Salaf as-Saalih from its sources and adhere to it and implement it upon themselves and others. I ask Allaah that He grants them insight into that which they are ignorant of and thus erred in or done it with deliberate intent. And may the peace and blessings of Allaah be upon our prophet Muhammad, his family and his companions.